UPPER LAKE, Calif. -- Days after wildfires left a deadly swatch of destruction in Northern California rural counties, new blazes exploded into life and threatened more homes in what has become an endless summer of flame in the Golden State. "We're advised that the fire was threatening structures," he said. The area was only about 40 miles north of where twin fires in Mendocino and Lake counties have burned an area nearly three times the size of San Francisco, destroyed seven homes and threatened 12,000 more. 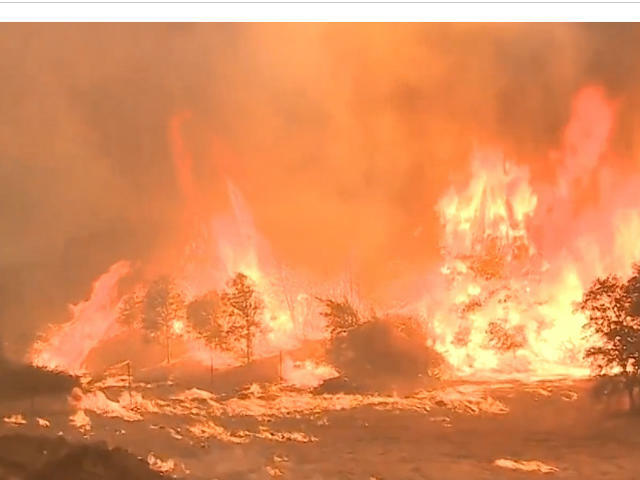 Afternoon winds whipped up a wall of flames destroying more structures in Lakeport, CBS San Francisco reports. "We had really erratic fire behavior, spot fires, fires pushing over ridges, down into canyons," CalFire spokesperson Paul Lowenthal told the station. Firefighters tried to save as many homes as they could as a 30-foot wall of flames barreled down the hillside. "Honestly, what I'm thinking right now is I just want this to end," Lytle said, adding that she was "exhausted in every way possible - physically, emotionally, all of that." To the east, another blaze Tuesday night raged through grassy cattle lands near Yuba City, covering more than 1-1/2 square miles in a few hours. "We had this rain at the beginning of the year and all that did was promote the growing of grass and brush," McLean said. "It's a Catch 22. It's growing more product to catch on fire. "We've never really been out of the drought," McLean added. "We need several years of significant rainfall ... to bring California back." The fire had burned more than 176 square miles and was 30 percent contained. Gaston said she couldn't get to her brother's house because, with the fire approaching, sheriff's deputies had blocked the roads and then she herself had to evacuate.